Since my first taste of youth ministry back in 2001 as a volunteer with middle school youth, I have had only one passion and felt only one call in my life. That call was to be a youth minister. After finishing college, I proceeded directly to seminary where I interned at a church in their youth ministry and graduated with a Master of Divinity. I interned a year after that with a large congregation in Tennessee. And then I landed at a large mainline church in New Jersey, serving as their Director of Youth and Young Adults. I served this congregation for 8 and a half years, saw youth grow from middle schoolers to 20-somethings, and experienced the joy of doing what I believe God had created me to do. It was all going as planned. Until one day, when it wasn’t. This month, different women from around the country have been invited to share their experience as youth ministers, as we celebrate women and their leadership. But what happens when everything comes to an abrupt end? In my case it meant walking away from a situation that had become unhealthy for my own well-being. Your story might be different but no less painful. On November 1, 2018 I packed up my boxes, hauled them out of my office and into my boyfriend’s car, and I said goodbye. I said goodbye to the church I had served for almost 9 years and goodbye to what has felt like a lifelong dream and calling. In the four months since, life has not looked quite like what I have expected. 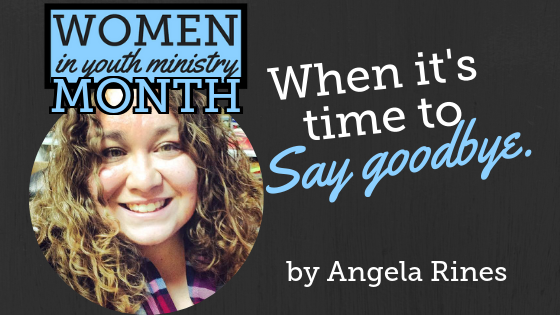 When I walked out the door that day in November, I did not have another job lined up – let alone another role as a youth minister. Here are the things I have learned in my last four months, walking through this liminal space. The first piece of advice I can give is to not fear walking away. Your own mental, physical, and spiritual well being is more important than anything else. You are not your calling. You are more than any calling, more than any role you can serve. And don’t believe the lie that if you walk away, you will never have an opportunity like this again. I have to remind myself this almost every day. If you have the ability to do so, take time off. It is not good for our wellbeing, nor is it good for the church to jump from a painful situation right into a new ministry role. I fully realize not everyone will have the opportunity I have had to take four months off of work. Do whatever is feasible for you. Build in time and space to recover before moving to the next thing. Fight for severance pay. Ask the next church to give you a month before starting. Do whatever it takes to have a time of sabbath. You will need it. Take care of your own well-being first. After leaving a church or being fired from one, you are your most important priority. Do not feel guilty for taking care of yourself. The most important advice I can give you is to get into therapy. Actually the most important advice I can give anyone in ministry is to get into therapy. It should be the first thing you do upon being hired. Thankfully I had been seeing my current therapist a year prior to everything falling apart. Beyond that, take time to read scripture. I found the Psalms helpful. Pray. Exercise. Eat delicious food. Watch your favorite TV shows. Read good books. Travel to a new place, even it’s the town next door. Go to brunch on a Sunday morning. Get a new haircut and pedicure. Lean on family and friends. And when you’re ready, find a new church to attend. For the first time in 18 years, I get to attend church as a new member and as a visitor rather than a new staff member. It’s been refreshing. Listen for the quiet voice of God. Do not rush the step of giving yourself space and taking care of yourself. It is going to be tempting to want to do that. Lean into the pain and grief, and let it be your teacher. Take care of yourself, but do not let yourself become numb. I can’t tell you what is going to come out of this experience for me, but I know that nothing goes to waste. I pray that God will find a way to use what was intended for harm, for good (Genesis 50:20). After a time, maybe God will lead me to a new congregation. Maybe God will give me new passions. That future remains to be seen. I have begun the search for my next job. I might continue to work with young people. I might work in retail. I might pursue a new career. But wherever I ended up, I know that remain a beloved daughter of God. And I am more than my call to youth ministry.